This is an amended and actualized version of a text from March 2009 which originally had the title “What I found out and what I want to tell”. It is another modest attempt to make sense of the world by comparing, correlating, and combining various words and names — quite similar to the way it is done in a thesaurus. Sorting and cataloging words is useful because most of our rational thinking/reasoning uses words. Words and terms are markers for voluminous samples of data or for complex thought sequences and these markers allow us to make logical conclusions about complicated issues. If we would not have the possibility to simplify, straighten, shortcut the reasoning process by using words for proven conclusions or scientific findings as building blocks for further reasoning, our intelligence would be rather limited. Words/terms/names are memory pattern in our cerebral cortex which consist of various connections/links to other memory patters and other locations of the brain. The links lead to audible and visual representations of a word/term/name, to associated feelings and reflexes, to other words, and to episodic memories. A thesaurus is a book or a database of words. The entries are usually listed in groups of synonyms and often include related and contrasting words and antonyms. A thesaurus normally does not include a definition of the entries, because usually the user of a thesaurus has already a fairly big collection of words/terms/names together with their emotional, visual, and acoustic annotations stored in her or his memory, providing a solid framework in which any new linguistic unit can be easily integrated and understood just by its relation to already stored units. My favorite thesaurus is the computer program Visual Thesaurus 3.0 from Zero G Software/Thinkmap Inc. The software was written in 2004 but fortunately still works (on Mac OSX Snow Leopard). The company regrettably changed its business model to a subscription-based online edition (http://www.visualthesaurus.com) and doesn’t support the program anymore. The program contains over 140,000 words together with spelling and definitions and it creates word maps with lines between related/associated words. The user can easily follow a chain of associations by clicking on word after word and by doing so making the activated word the new center of the map. This is fairly close to the way our associative thinking works. The program unfortunately has a serious deficiency: It is not user configurable. The individual thesaurus of any persons brain will differ from this program (and from any other thesaurus) by including associations that are not commonplace and excluding prevalent terms and associations. Everybody has his own thesaurus and so has the author of the following text, which is in essence a tiny subset of an individual thesaurus, a “micro thesaurus” of words that are related to ethics, to our well-being, and to our interaction with the environment. This text is based on the premise, that we should aim for the well-being and long term survival of humans and that the preservation of nature and the well-being of our fellow animals is an absolute precondition for achieving this goal. Based on and emanating from the mentioned assumptions, the text names and sorts various things that benefit our lives. The things can be moods, attitudes, methods, occupations and anything else that can be represented by a word or a term. The words are sorted in four categories just for practical reasons — there could be as well five or six or only three or any other number of categories (there is already a list with six categories in the works). The categories are commented and explained to make the categorisation more understandable and to convey a clear meaning of the included items. All words/terms are related to each other and connected to each other and the categories morph into each other. Everything is related to everything. The comments and explanations will maybe misunderstood by some readers or not be understood at all. We all have our own distinct vocabularies and define our personal reality in our very own terms, which may be or may not be congruent with the terms of other individuals. Words are words and can have various and even contradicting meanings and the reality can be described in a thousand ways and everybody will describe it different. This category subsumes all beneficial activities that are not dedicated therapies (though many of the activities have therapeutic effects). The value and the ranking of the included items may differ individually. Musicians for instance will see music as the most important item and maybe even establish music as a category by itself, because it is predominant in their life as their main vehicle of expression and their main self-therapy. For other people other arts, like painting, sculpting, designing, and writing may be as important or even more important than music. Even activities that are not generally considered as artistic expressions can be therapeutic and enrich our lives. For instance: acquiring skill that allow us to make a meaningful contribution to the community and improve all our lives. Though the job market may be tight at times, one just has to look around to see the desperate need for community services, the need for qualified and well educated individuals that can keep the complicated social and economic structures intact or rebuild and improve them (for example medical personal, teachers, scientists, technicians and engineers). There are also many jobs that are neither glorious nor pleasant or are even dangerous and nevertheless crucial and indispensable. May it be a nurse in a personal care facility or a firefighter or a waste disposal worker, they all can find pride and satisfaction in the notion that this work is necessary for the common good. Not to forget the farmers and rural workers, that provide our food! This category is about the therapies, practices, methods that help us achieve a harmony of body and mind and a general well-being. A common and narrow definition considers meditation as a practice to achieve calmness and physical relaxation by diminishing the stream of confusing thoughts that normally occupy our mind. Maybe a more fitting term for the category would have been “Body – Mind Interventions,” this expression though seemed too abstract to use it as title. All in this category listed therapies reduce distress, help to keep us fit and strengthen the immune system. They elevate our mood (by balancing the levels of neurotransmitters), achieve a reduction in blood pressure, epinephrine (adrenaline) levels and heart rate. Some therapies help us detect and relieve subconscious tensions, detect and eliminate subconscious blockages and heal or alleviate traumas. This category could also be described as a list of all the means that let us find and develop the matters described in category four. Believes are the framework of basic assumptions in our mind, the stable structure that we can hold on in an ever changing world. Believes are not absolute, though some may be enhanced by hard wired behaviors that we acquired in the course of evolution (Decalogue: “You shall not murder”). Believes can be proven wrong or right by life experience, they can be shattered, we can abandon them, throw them overboard, and look out for new ones. Searching for the “meaning of life,” searching for a purpose is what we do, when we need to find new believes. Someone with strong religious believes could find the idea unbearable, that her or his believes may not be the absolute truth. This text is not intended to dismiss anybodies believes and the presented list with it’s four categories is just a working hypotheses. It nevertheless needs to be mentioned, that religious believes often are interpretations of sacred texts by scholars and that some religious believes were and still are causing conflict, human suffering, death and destruction. A few examples: Crusades, French Wars between Catholics and Huguenots, Thirty Years War, Saxon Wars, North Ireland conflict, the partition of India, the Jihad of Islamic fundamentalists. The term “Direction” is added to the title of the category, because believes by themselves are value neutral, they can be good or bad, positive or negative, helpful or detrimental. One can evaluate believes by their effect on the individual and the society. The result is the final judgement. That means, if the goal is to feel well, to reach a harmony of body and mind, to live in harmony with the fellow humans and all other creatures and to preserve nature, one has to choose believes that are most helpful for reaching this goals. Some prevalent believes, like superstition, prejudices, racism and nationalism, will be detrimental and harmful. For people with adverse goals the same believes will appear to be positive and helpful. 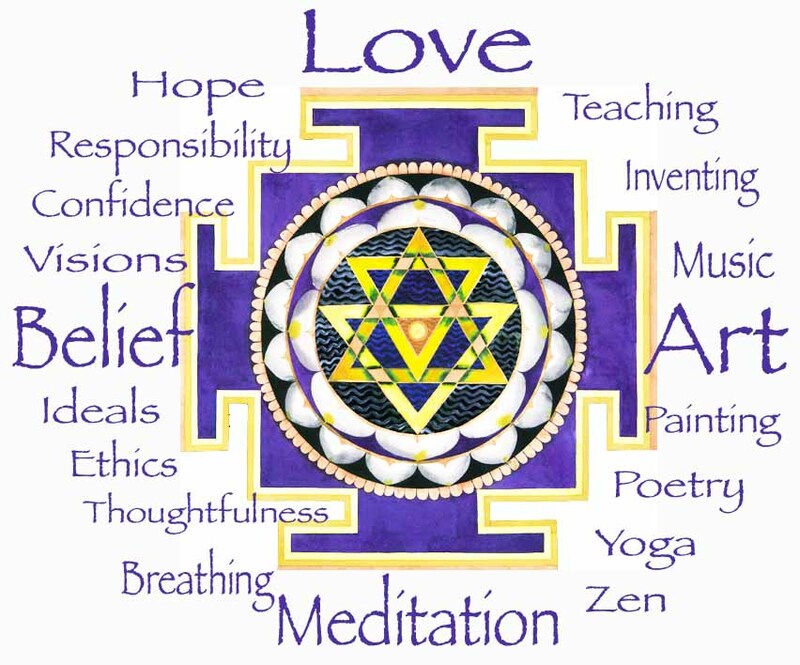 If one wants to feel well, to reach harmony of body and mind, and to live in peace with fellow humans and all other creatures, one will probably need not much further believes, because this goal by itself is a strong believe that can give guidance in any situation at any stage of our life. At this point most readers will have realized that the mentioned urge to feel well and to live in harmony is the reason that this text was written in the first place. It would be so much easier to live in a world where everybody feels well and strives for harmony! Publishing a text is a very modest contribution to the common good but it nevertheless could encourage and inspire readers, could point to problems and show solutions. We don’t live in a perfect world and in the present state mankind is far away from peace and harmony and seemingly drifting even further away from the ideals that are mentioned here. But there are millions of people hoping, searching and tirelessly working for this ideals. Without their efforts the situation would be even worse. Words have various meanings and different connotations to different people and just for good purpose it should be noted, that the title doesn’t refer to the “Love”, that is advertised on pornographic websites (though sexual relations can also include the kind of “Love” that is meant here). This category is about the feelings that warm our heart and help us to endure hardship and pain. It is about the advanced state of mind where we don’t worry anymore and accept our fate and nevertheless do everything to improve our live and the lives of our fellow creatures. This category is about he state of mind where we are calm and composed and focused and where we know exactly what to do. Just to mention a few examples, that fit perfectly into the category: Love of a mother for her child. Kindness and tenderness of an old couple who will stay together and care for each other till the end of their lives. Compassion and determination of a social worker facing the helpless and destitute. Admiration for a role model. Gratefulness of victims to the emergency crew who saved their lives. Satisfaction of a volunteer doing charity work and of the old lady who despite struggling herself donates all her spare money for the ones who have even less. This category is about feeling good. It for sure feels good to feel good and it is wonderful to be happy and relaxed and cheerful and content. Love in its universal meaning is the greatest experience and the most mature and highest state of mind. Why are so many people missing out and not able to reach this state? The following lists are an inventory of negative, harmful and detrimental things, sorted and categorized in the same way as the list of things that benefit our lives. This hopefully will further clarify the meaning of the words and their interconnections and also show directly which things we have to avoid and against which developments and tendencies we have to fight. Simply listing the antonyms of the beneficial things didn’t always work, because many terms have no counterpart with the exact opposite meaning or the antonyms would be ridiculous terms that instead of clarifying rather would obscure the meaning of the categories. The following comments to the negative categories are short, because they are only meant as an addition to the comments of the positive categories. This category lists negative activities, that hurt individuals, the whole society and all nature. Expressions like “being shallow and superficial” are not included, because attitudes/mind-sets fit better into category three. The expression “being shallow and superficial” is actually a link between category one and three. This category lists condition that have a negative effect on the personal well being as well as conditions and attitudes that hinder therapeutic measures which could achieve a harmony of body and mind. This category includes negative mind-sets, attitudes and believes. Some of the entries could also be regarded as feelings (like despair and hopelessness) and would as well fit into the fourth category. Does this need any further explanation? Everyone who experienced violence, or once had a choleric fit, or once lost control, knows how it ends. Everyone who doesn’t live in a cave completely secluded from the rest of mankind will be aware of the result. One just has to read the daily news. 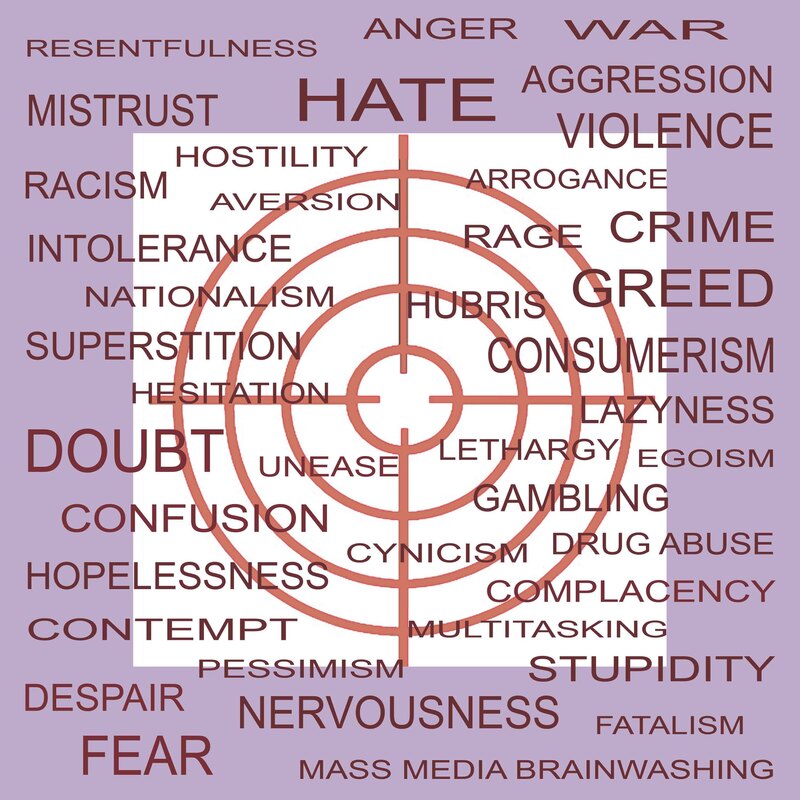 Most evil in this world can be traced back to the feelings of “Hate and Aggression”. As stated at the beginning, sorting and cataloging words and writing down a “micro-thesaurus” like this is only one of many possible approaches to acquire a broader understanding of the world. Hopefully one or the other reader can get something useful out of this text. Suggestions and corrections are always welcome. The choice of words and categories as well as the comments and explanations are based on various assumptions. Detailed and elaborate explanations about these assumptions can be found in the 146 previous blog posts but as apparently not many people can be bothered to read old posts and some of the texts also contain outdated material there will be further postings or updates of old texts to explicate and make clear, in which way and with which reasoning one could arrive at these assumptions.